Saturday, TriSec wrote a blog about the bees. It's alarming, no question about it. In light of that, two days ago the Obama Administration announced it would take new measures to conquer the bee decline in the United states. A new federal plan aims to reverse America's declining honeybee and monarch butterfly populations by making millions of acres of federal land more bee-friendly, spending millions of dollars more on research and considering the use of fewer pesticides. While putting different type of landscapes along highways, federal housing projects and elsewhere may not sound like much in terms of action, several bee scientists told The Associated Press that this a huge move. They say it may help pollinators that are starving because so much of the American landscape has been converted to lawns and corn that don't provide foraging areas for bees. "This is the first time I've seen addressed the issue that there's nothing for pollinators to eat," said University of Illinois entomologist May Berenbaum, who buttonholed President Barack Obama about bees when she received her National Medal of Science award last November. "I think it's brilliant." The Administration is also declaring Interstate 35 as a butterfly highway in order to save the beautiful Monarch butterfly. That�s thanks to President Obama, newfound friend to imperiled pollinators everywhere, and his strategy for protecting the nation�s insects. 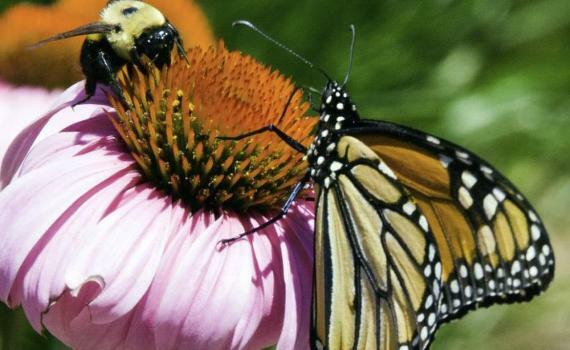 Among the proposals is a plan to create a pollinator highway along the I-35 corridor, which extends from Mexico to Minnesota and follows a main route for the annual monarch butterfly migration. And though monarchs seem to have little in common with an I-35 commuter, the highway is actually an ideal way for them to get where they need to be. According to the White House strategy, highways are usually surrounded by low vegetation and lots of sun � perfect butterfly habitat. Its extensive north-south reach also makes it a perfect corridor for migration, whether in response to the changing seasons or as adaption to climate change. I mentioned in Tri's Blog on Saturday that while the issue of a dwindling honeybee is dangerous to our nations crops, I think we often overlook the native bee. One researcher is creating hotels for them. But Johnson believes it�s worth the effort. Unlike honeybees, which gather in colonies and were imported from Europe centuries ago, most North American bees usually live on their own, according to the New Hampshire Business Review. But it�s a dangerous world for a small, flying arthropod (see: pesticide, habitat loss, hunger) and the 4,000 species of native bees also need a safe place to make their nests. They may not produce honey, but they are still essential to pollinating the nation�s crops, gardens and wildflowers. �If we can take care of these bees, we can have fruits and vegetables and tomatoes, even if there�s problems with the honeybees,� Johnson said. More flowers, butterflies and habitat for bees along the nation's highway system might be a beautiful way to save our agriculture's and environment. I may be overly hopeful, but these actions cannot not hurt and perhaps will stem the tide. You can thank Lady Bird Johnson for getting the ball rolling on this one. Mrs. Johnson's view of this project went far beyond planting daffodil bulbs. She was concerned with pollution, urban decay, recreation, mental health, public transportation and the crime rate. The Committee agreed to plant flowers in triangle parks all over the city, to give awards for neighborhood beautification, and to press for the revitalization of Pennsylvania Avenue and the preservation of Lafayette Park. The Committee also generated enormous donations of cash and azaleas, cherry trees, daffodils, dogwood and other plants in evidence today in Washington's lovely parks and green spaces. Perhaps most importantly, Mrs. Johnson's effort prompted businesses and others to begin beautification efforts in low-income neighborhoods hidden from the much-visited tourist attractions. One of her key efforts was an effort to clean up trash and control rats in the Shaw section of Washington. That developed into Project Pride, which enlisted Howard University students and high school students to clean up neighborhoods. Mrs. Johnson funded the project with a $7,000 grant from the Society for a More Beautiful Capital. One thing I love about traveling in the spring and summer is seeing wildflowers along interstates. Letterman. Suit of Chips. That is all. Let's go down again, Once more, like a tea bag…. <== me, after staying up late two nights in a row to watch the last couple of Letterman shows. This exists! I present to you…. The perfect gift for your favorite Alex Jones fan. I was gonna say I think my grandmother had something like this. jade helm is deadly after all…. It killed the blog. I hope it doesn't involve an arranged marriage and spousal abuse that ends in running away to a 70s hippie retreat. First full day of staycation. Mrs. Rabbit safely arrived on the Mississippi Gulf Coast (90 degrees +). Cleo and Sophie figured early on after I got home that Mommy was gone. Cleo decided that she would snuggle close to me last night, while Sophie threw eye daggers at her. Now they're doing what they normally do, sleep in the sun. The ol' Honda is in for its 280K mile checkup, and it's gonna be a biggie. Ball joint and a couple of stabilizer arms (those probably got whacked by a pothole or two). Was sorta prepared for it. Can't really complain. Heard people were not happy with that one. That feeling I have when I have too much cheese. Boy Scouts' president calls for lifting ban on gay leaders. Holy Hannah, this is big. Just wanted to see which one you were talking about. It is that time of year. I wasn't fully satisfied with the crazy train that was the season finale for "Arrow." "The Flash," on the other hand, even with the ignoring of quantum paradox, was great, it really set up a bunch of stuff for next season. I heard The Flash was pretty good - I'm like 2 or 3 epis behind. And I haven't even started this season of Orphan Black yet! Now I know what Cleo wanted. She wanted me to sit in Anne's rocking chair so she could curl up in my lap and take a nap. Nothing as calming as a purring cat curled up in your lap. My baby. He's Klassy like that. Sounds like this one's for you then! and yes, it is huge! he's spot-on there; membership and fundraising have completely tanked over the last 3 years or so. Boy Scouts of Wingnutistan won't survive for much longer at this rate. Did I ever tell you all that I once had a full-blown shouting match with a parent over this policy at a recruiting event whilst in full uniform? The Hill really has it out for Hillary. Lobbyists across town were already lining up behind Clinton as early as last March, including Steve Elmendorf, president of Elmendorf | Ryan, who said at the time it wasn’t even a “close call” as to who he’d support. Jonathan Mantz, of the mostly Republican BGR Group, served as Clinton’s national finance director during her 2008 presidential bid. He also serves as an adviser to the super-PAC Priorities USA, which was created to support Obama but has now shifted its focus on boosting Clinton. Still, Akin Gump’s bench of Clinton supporters runs deep. The firm employs others in the Clintons’ orbit, including Vernon Jordan and Al From. Jordan, who became close with the former first family after serving as a senior adviser and confidant to Bill Clinton, now works as a senior counsel at Akin. Meanwhile, From, who founded the Democratic Leadership Council, which was later absorbed into the Clinton Foundation, worked to get Bill Clinton elected president in 1992 and advised him during the transition into the White House. He is a consultant with the firm. But is it me or does something kinda stink here? Are Super Pacs now just lobbying forms? Scoop you have been waiting to break that one out. 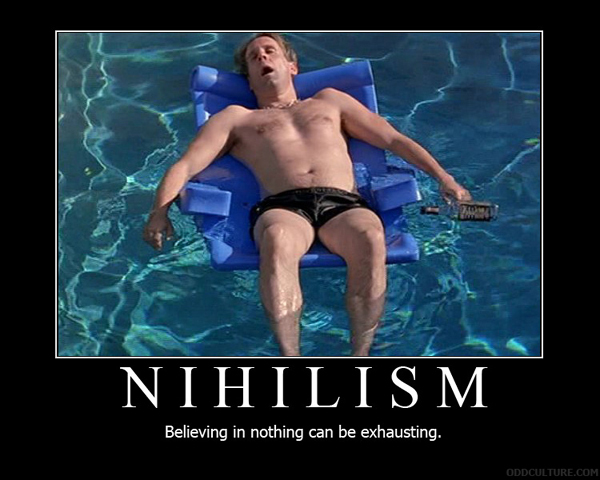 That and Nihilist Arby's. Yeeeeep! Actually I didn't know there was a Taco Bell one until today I had seen there were a whole bunch of 'em tho. Tacobell only has eight tweets so far. Well I hope this does't bode well for this young woman's future. This is AWESOME local reporting. She might grow up to write dinosaur erotica.